BricsCAD V18 represents the future of the .dwg format, and now it’s available for the Linux operating system. 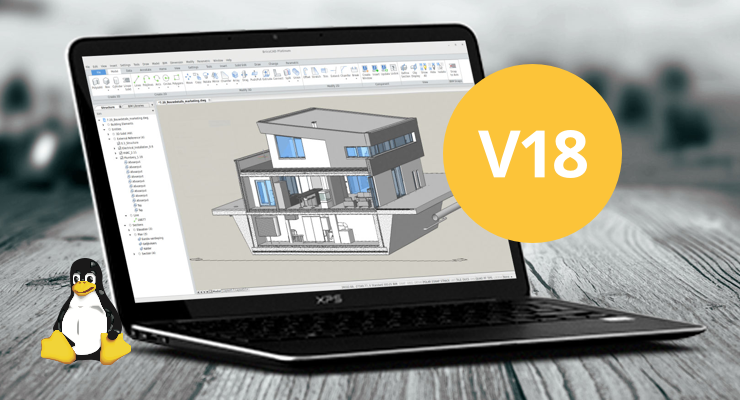 V18 for Linux offers workflows for general design, mechanical design and BIM. We’ve made all of these workflows available in one product, based on .dwg – the industry standard file format. Save minutes per hour with V18’s simplified user interface – including the new Manipulator Widget, and a greatly enhanced Quad cursor. In V18 for Linux, you can access your drawing metadata quickly with the improved Drawing Explorer and the new Content Browser, Layout Manager and Structure Panel. BricsCAD BIM puts the focus on creativity, and lets you move to BIM on your schedule. Start with a massing model in true 3D solids. Add details and modify your conceptual design deeply. Make your design decisions and let the computer do the tedious work for you. Using advanced machine intelligence, BricsCAD BIM speeds the process of turning your 3D concept model into a full Building Information Model. There’s a lot more to BricsCAD V18 for Linux! You can try BricsCAD, BricsCAD BIM, BricsCAD Sheet Metal and Communicator for free for 30 days at bricsys.com. The English version of BricsCAD V18 for Linux is available today. Other languages will be available in the coming weeks.